Our research suggests that the lack of education related to literacy is problematic, and the situation is exacerbated in the field of education. My last post was a bit of an experiment. I had an idea of what I wanted to say. When I’d written out the text, though, it didn’t say enough. I tried adding more words, but that turned out making the text say less. I tried changing the words, but it turned out they were working pretty hard to say what I wanted them to say. It occurred to me that pictures might help. From time to time, images have helped communicate what I’m trying to say in a post. I looked around Creative Commons, but couldn’t quite find what I needed. This led me to the drawing option in Google Apps. I was able to create rudimentary versions of the images my words couldn’t stretch themselves to cover. When I tried to embed the images, they didn’t quite fit. The post still seemed flat. I wanted it to say more. I needed to write in video. I needed image, sound and words to work together to say more than what I was able to say in text alone. This has me thinking about the kind of message creation called for in classrooms. The as I’ve been thinking about recently, the essay is the coin of the realm. Should it be? In attempting to make images, texts and audio work together, I needed to pull together understandings of message and meaning well beyond putting sentences into paragraphs and paragraphs into some sort of cogent narrative. What’s more, I still needed that narrative to make it all work. I still wrote the post. Even more importantly, what I put together wasn’t very good. It did what I asked it to do, but it could be so much better. The room for revision in fifty different directions makes me want to jump back in and try. When I was in my online program last year, I couldn’t figure out why this kind of composition wasn’t a part of the courses. We were people learning together who would never be in the same physical space. The easiest thing to do would be to construct an environment that allowed us to be people with each other and build learning artifacts that actually spoke to who we were. This is the type of writing we should be teaching. Not forsaking traditional texts, but folding them, extending them, and reconnoitering them into what they can be. Students’ writings want to say more. We should let them. The secret is to gang up on the problem, rather than each other. Matt and I looked at each other halfway through the class period and asked each other why we hadn’t tried this until the end of the third quarter. In the last class of the last day before Spring Break, our students were working together, collaborating and mentoring one another all the way to the end of the period. My original plan had been for my G11 students to visit Matt’s G9 class and share the vignettes they’d crafted and then discuss their writing process. I saw it as a chance for the upperclassmen to mentor the freshmen in reading and writing. Surely, the younger students would be enamored of stories from their elder peers’ lives as readers. Well, probably not, now that I type that. The point is, we’ll never know. As in the best learning experiences, very little went as planned. Matt’s class had been disrupted earlier in the week by a field trip that had only taken a portion of the kids our of the room. Some students were working on making up the day, others were revising their own memoir projects and still more were working on a smothering of other smaller assignments. As shocking as it was, I came to terms with the fact that these kids weren’t clamoring to hear vignettes detailing my students’ lives as readers. Instead, we did something much less contrived. We had the older students pair up and work with the younger students. They sat around Matt’s room. They occupied tables in the hall. They migrated to my room for more space. The conversations were real and earnest. “Walk around and introduce yourself. Then, ask how you can help,” I told him. I looked to one side of Matt’s room and saw one of my students who is most frequently off-task completely focused on helping one of Matt’s students improve his writing. I would be lying if I told you I hadn’t been struggling daily to find ways to motivate this student to engage in class. Turns out she wasn’t waiting for my help, she was waiting to help. After I’d heard a student advise, “You’ve got the outline of a paper here; now you need to fill it with what you want to say,” another one of my students approached me asking what he should do now that he’d helped two students with their papers. He looked at me as though I’d just given him secret teacher knowledge. In reality, the whole process was a reminder of my general lack of teacher knowledge. While I’m keen to point out teaching’s general lack of willingness to utilize the wisdom of the elders of the profession, I should also be looking to the wisdom of our older students. My students have walked this way before. They’ve known what it is to stare confoundedly at a laptop screen trying to piece an argument together. They’ve also felt alone in the effort to be better writers. Every one of my students, no matter their level of proficiency, was an expert today to someone who benefited from that expertise. I can and should attempt this type of cross-pollination more frequently. Failing to do so ignores the resources of the school and reinforces the artificial boundaries adolescence creates in the presence of a difference of two years. The thing about digital literacy is its inherent squishiness. Educators argue whether the tool or the purpose matters most. They debate whether something being “electronic” constitutes “digital.” Does it need a screen? A keyboard? More than that, teachers must decide what it means to read and write digitally and how to assess those skills. Just as teachers were working to conclusively define literacy, digital literacy arrived on the scene and the discussion started again. In fact, the most solid of ground to be found in the debate surrounding digital literacy is the agreement that, whatever it is, it is important to the success of our students. Even then, not everyone is in agreement. As the Grade 11 students are reading books of choice for the most part this year, I’ve been working to incorporate types of texts outside of novels into our reading. This has taken the form of long form journalism pieces, op-eds, short stories or anything else. Part of what we’re working toward is endurance in reading. Part of what we’re working toward is reading as a social experience. I’ve known about the Think Aloud as a reading strategy for a few years. I’ve tried to stay away from it for the sheer boredom of it. It doesn’t ask much of my strongest readers and can feel as though I’m patronizing those students reading at lower levels. What is the evidence the author uses to support his claims? What do you think the future of paper as a medium for transmitting writing is? How does this article shape your understanding of the world? Students had time in class to begin reading and thinking. What they didn’t finish became homework. When they entered class the next day, I handed them printed copies of the piece with the notes that came to mind as I was reading. The students had approximately 7 minutes to mark up the text with any thinking they had and wanted to add to my notes. Conversation began with each speaker calling on the next. What happened was a great reminder of the kind of conversation our students are capable of. It’s what they were hoping for when we went to the Town Hall Meeting. At one point, it occurred to me we could benefit from adding our school librarian’s voice to the mix. I called and invited him. Matt, a grad student completing some observations in our class, commented afterward on how the students had kept the conversation moving even when I was on the phone. I’m hoping it’s because they owned the conversation and I didn’t. In fact, the rules within discussion are that I too must raise my hand and wait to be called on when I want to contribute. That was classy. What do you think? We’re dedicated to teaching the whole book, but not the whole video. This does a disservice to our kids. They don’t know how to read NBC. I’ve been using Ma Vie en Rose as we examine childhood and narrative in Sexuality and Society in Literature. It’s accompanying our reading of Peter Pan. In Shakespeare, we’re looking at Elizabeth. In Grade 11, the kids watched pieces of The Taming of the Shrew and Deliver Us from Eva in their study of the print version of The Taming of the Shrew. As such, I’ve been looking for resources. There is no rule that says a video must be shown from start to finish. While some films have valuable content throughout and are good to show completely, sometimes individual scenes are all that are needed to achieve the goal. Take out “video” and “shown” and all the rest and make it apply to books. My students are reading / assigned to read each of the book-based texts in their entirety. We look at arc, language, character change, etc. The temptation, though is to watch clips of the films as though they are lacking for arc, language and character change. Over the last few weeks, students have asked if we’re going to finish the films. They’ve never asked the same of books. Now, this might be because they’ve conditioned into believing they will always read a book from cover to cover. I’d argue they don’t care as much. For Ma Vie en Rose and Elizabeth, I’ve decided to show the full films. Grade 11 is on a new unit and so Shrew won’t fit. My great-aunt Barbara recently commented that it wasn’t until recently that she realized she didn’t need to finish every book she started. She’s in her 70s and has decided she’s not wasting any more time on books she doesn’t like. She got that belief in finishing every book from somewhere. If they’d had video to use in her classroom when she was little, I don’t imagine she’d have gotten the same message. This all leads to the bigger point. We’re doing our students a disservice when we don’t teach them how to watch movies. We’re doing them a disservice when we don’t teach them how to watch TV. Books are the coin of the realm, for now. That is only because of who is governing the realm. You want to get a room of adults interested in education on your side? Stand in front of them and bemoan the prevalence of television and hulu and youtube and all other video mediums. Complain about how kids aren’t reading books, but Hollywood is making millions. I guarantee nodding heads – television’s the devil. 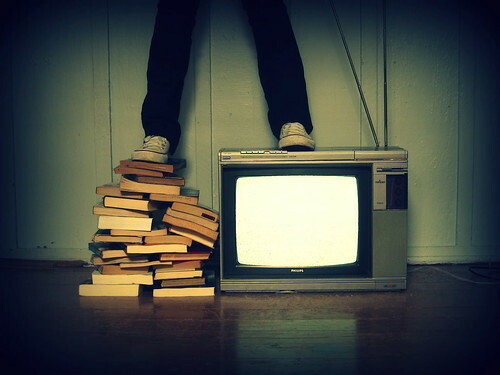 No one taught them how to watch television – certainly not in the same way they were taught to read. Television and movies, for the vast majority, don’t exist as rich, valid texts. I’ve friends who proudly proclaim they have no television in their house. Oftentimes, these proclamations are met with, “I wish I had that kind of self-control.” Why? We would be a little weirded out if someone declared they had no books in their house. Yes, video and the printed word are different and ask the brain to do different things. That’s not a statement of worth. There are good books and bad books. There is good video and bad video. The difference is we spend years teaching students how to refine their tastes and understanding of what are good books and almost no time on video. Perhaps teachers a few generations decided to take the “ignore it and it will go away” tack in response to the advent of video. It hasn’t worked.